How Do You Choose the Right Skincare Line? Up until recently, I didn’t give much thought to my skin and the reality of how harmful our environment can be to our skin, not to mention how it can be affected with what we put into our bodies. This year I turned 30 (eeeeek! ), and as strange as it may sound, I started to have a new outlook on many things – one being my skin. Here’s the problem: How on earth do you pick the right skincare products when the possibilities are truly endless? I’m concerned with the content of my skincare, and I want to know that what I’m putting on or in my body isn’t going to be harmful in any way. It seems that going with a skincare line that has all natural ingredients, such as shea butter, rose, and other natural ingredients would be the way to go, but even taking a look at the many options out there for natural skincare products will have you throwing in the towel before you even get started. I’ve heard a number of amazing testimonials of L’Occitane products, which uses plant based ingredients (many of them organic), and a quick look on their website displays an natural ingredient list a mile long. That, I like! I just feel so lost in the skincare sea of uncertainty and I really need some advice from all of you! Readers Weigh In! 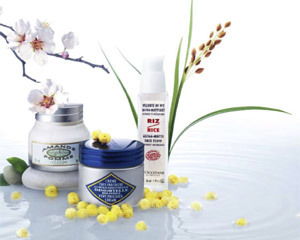 Have you tried L’Occitane products? What natural, organic, or plant based skincare have you found that works for you?